Dead Band IEC 61298 -2 Edition 2.0 2008-10 Cls. Impulse voltages withstand Levels of rotating a.c.Machines with form-wound stator coils. 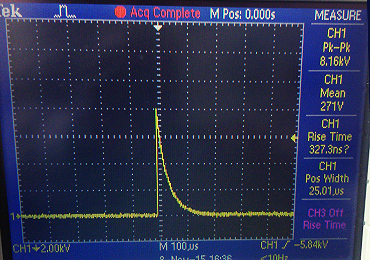 1.2μs a time-to-half-value of 50 μs and a peak value of the impulse voltage Up (around 30kVa.c). first voltage peak at the terminals of the sample coil shall be 0,2 micro second. at 1 kV / sec until the coil breaks down.